While winter brings the joys of dancing flames in the fireplace, it can also mean a bland view of a landscape devoid of color. But, when gardens are stripped of blooms, and branches are covered with a blanket of snow and ice, you can naturally ornament your garden with the brightly-colored, fluttering wings of our region’s wild birds. This season, consider giving your loved ones the gift of entertainment, twittering morning songs, and the satisfaction of caring for birdlife with affordable (and adorable!) bird feeders and houses. Before choosing the first thing you see, it helps to be familiar with a few of the area’s most common bird species, their favorite foods, and how to choose accessories they are prone to visit. Even when large, frigid flakes of snow begin to fall, there are many birds who remain staples of the area. To give you an example of the friends you can expect to make this season, we chose a sampling of five species to highlight, and will tell you how to set your birds’ dinner table and who will send an instantaneous, twittering RSVP! Red-bellied woodpecker. Red-bellied woodpeckers are year-round residents of our area and can be quickly spotted by their vibrant red markings. These birds, of course, prefer wooded areas, and make their nests in dead trees. Woodpeckers may be encouraged to roost in a sturdy bird house attached high in a tree, mimicking his natural habitat. They enjoy suet, peanuts, and sometimes sunflower seeds. Tufted titmouse. Like the red-bellied woodpecker, titmice are year-round residents of the area, and can be quickly identified by their large, black eyes that seem to hold a quiet, eager expression. These stout little birds are “secondary cavity nesters”, meaning they cannot construct their own homes, and depend on holes in dead trees, or bird houses. They like sunflower seeds, but you can also find them dining on suet, peanuts, and other seeds. Northern cardinal. Summer or winter, cardinals are reliable sources of vibrant red color, and feature a short, thick bill and prominent crest. They do not often use bird houses, but they will most likely roost close to your home if you have thickets of dense vine and shrubs, or provide nesting materials such as small twigs, pine needles, and grass clippings nearby. Virginia’s state birds are not picky eaters, although they do seem to have a special interest in sunflower seeds. Blue jay. These medium-sized birds will be sure to hold your attention with a prominent crest, and beautiful blue, white, and black plumage. Blue jays can be encouraged to roost in a bird house when placed near trees. Their nests typically consist of moss, bark, small twigs, and other plant materials. Jays are known to dine on peanuts, sunflower seeds, and suet. They also frequently visit birdbaths, and will be sure to keep you entertained on dreary winter days. Carolina chickadee. These notoriously-friendly little birds can be spotted by their stout body with a black cap, black bib, gray wings and back, and whitish underside. They are known for becoming so trusting they will even eat from your hand if you are patient enough! If you want these talkative creatures to be common in your yard, mount a nesting box near a forested area and fill it with wood shavings or sawdust. They enjoy suet (especially peanut butter), sunflower seeds and peanuts, along with berries and insects. 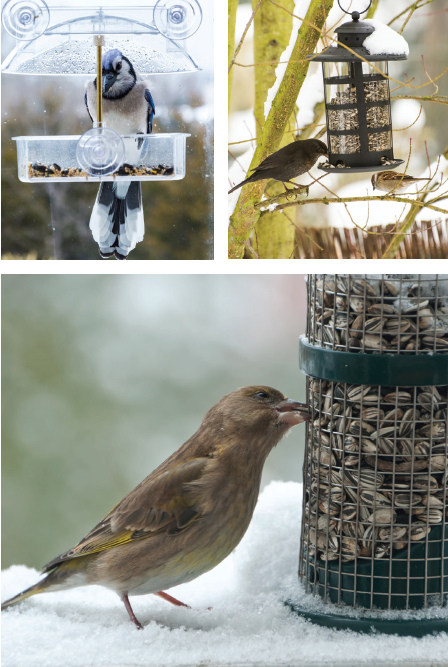 Each of these birds prefers to dine from feeders such as trays, hoppers, suet cages, or window feeders. These feeders can serve as the perfect Christmas gift for any adult or child wildlife enthusiast. 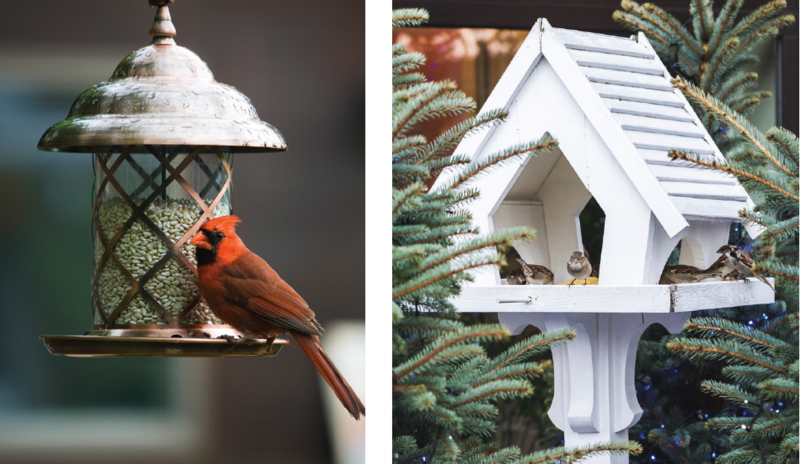 Whether living in a rustic farmhouse, or an apartment in the city, there is a feeder suited to each home style, and bird species! A simple tray, or platform, feeder typically attracts the widest variety of seed-eating birds, and can be used to effectively serve larger seeds. With a few inexpensive construction materials, you can also make your own tray feeder, and provide the perfect homemade, functional gift for family and friends at Christmas. This type of feeder needs to be fitted with a squirrel baffle on the pole or suspension chain, unless you don’t mind sharing with other creatures. Hopper feeders (sometimes called “house feeders” because of their appearance) are another popular choice among bird lovers, and make adorable gifts. They often come in ornate shapes resembling detailed houses or barns. Functioning much like an automatic feeder, they also protect seed mixtures from the weather. A squirrel baffle is useful here too. Suet feeders are square, plastic-coated wire cages which are filled with high energy cakes made from a mixture of tallow or lard, seeds, dried fruit, and sometimes mealworms. They are irresistible to many types of birds—and squirrels too, so plan accordingly! Window feeders are small plastic feeders which affix to window glass and attract many small species right to your favorite viewing spot. To be sure squirrels can’t jump to them to dine, choose a window which isn’t close to low-hanging branches. Because of these feeders’ position on the glass, they’re also handy for alerting birds to the presence of a window and preventing crashes, by breaking up the mimicked reflection of the sky. These versatile feeders are a great gift for anyone who wants a front-row seat for bird viewing this season. Whichever feeder you choose, hang it in a safe and visible area, ideally about ten to twelve feet from natural shelter such as bushes or trees. If you’re not using a window feeder, make sure to leave at least ten feet between feeders and windows, to avoid fatal collisions. And finally, getting water from snow or a frozen source drains birds’ precious winter energy, so providing a clean, thawed source of water during the winter will ensure your bird friends are healthy and happy. If you’d like to provide birds with a comfortable spot to beat the winter weather, consider a roosting box. Roosting boxes are different from summer bird houses, which are meant for nesting. 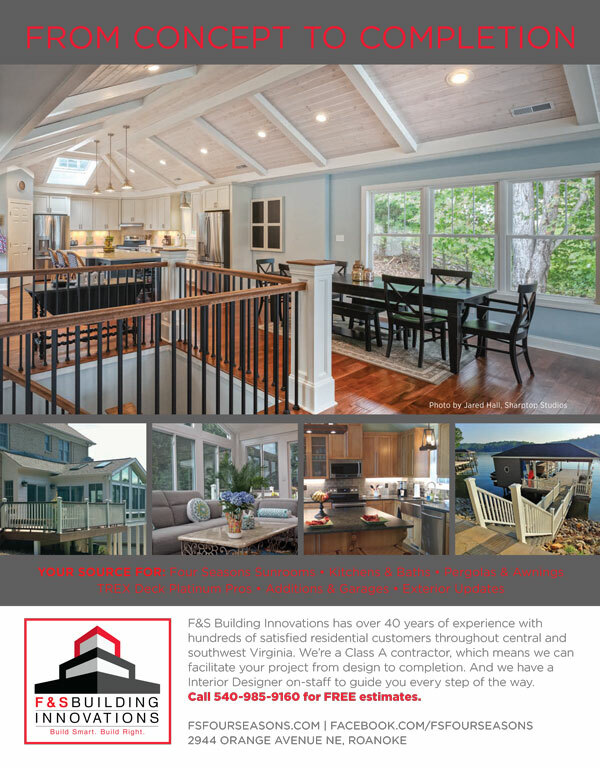 They are designed specifically for cold weather, with decreased ventilation and multiple interior perches to accommodate a variety of feathered friends. They should be positioned against prevailing winds, and facing south to receive the most sun. For maximum safety, mount your roosting box on a slick metal pole adorned with a critter baffle, and provide extra insulation with wood shavings, small twigs, and grass clippings. Because they are not typically as ornate as summer bird houses, a custom design on the outside of a roosting box would make a wonderful Christmas surprise for friends or family. 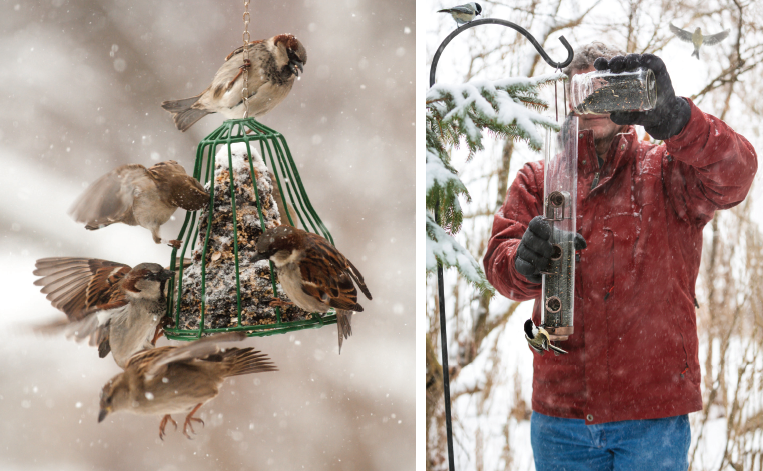 Whether a bird feeder or a roosting box, giving the gift of caring for the area’s birds is sure to bring a smile to the face of your friends and family this season. If you’re dreading the upcoming cloudy winter days, you may even personally adorn your own land with one of these great gift ideas!